We wrote that FINRA’s BrokerCheck allowed brokers to report cases adversely resolved as “pending” last week, in Bad Brokers Falsify Their BrokerCheck Records and No One Notices. We provided two examples. The first included a large award in FINRA’s awards database that had not been correctly reported as adversely resolved on the broker’s BrokerCheck but had been correctly reported on her employer’s BrokerCheck. Our second example, was of two adversely resolved filings against another broker. We showed that the difference in the false reporting versus the correct reporting significantly changes the probability of future investor harm using FINRA’s model applied to all the BrokerCheck data. 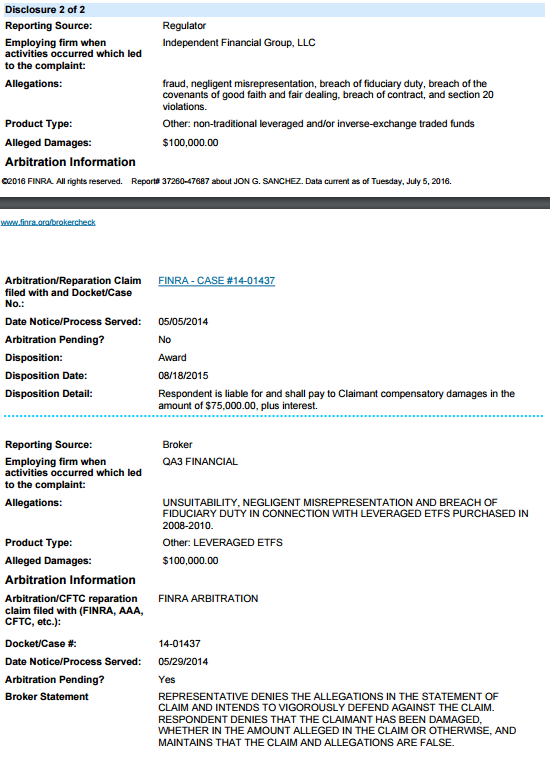 FINRA largely fixed these two brokers’ BrokerCheck records last week after we posted about the errors. As we showed last week Mr. Sanchez’s BrokerCheck record, current as of June 29, 2016 (available here), listed two “pending” customer complaints. 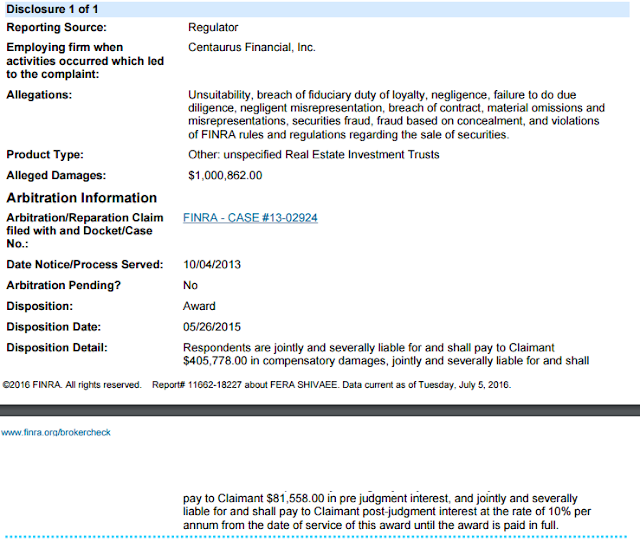 Mr. Sanchez’s BrokerCheck record, current as of July 5, 2016 (available here) changes these two customer complaints to FINAL with an html link to the award. This is, of course, a big improvement but investors who looked at Mr. Sanchez’s BrokerCheck report over the past 10 months were misled into believing arbitration panels had not ruled against him. 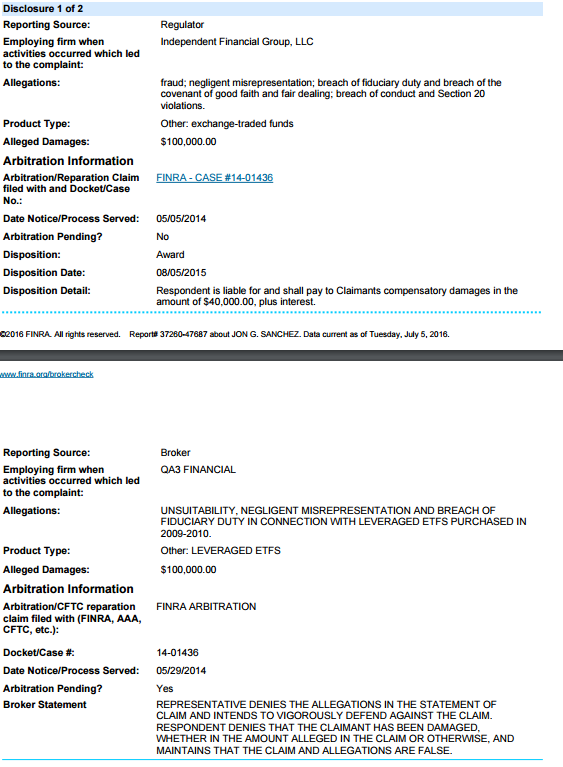 As we can see in the images below, the updates were provided by FINRA, not Mr. Sanchez or his employer. Our other example was a Centaurus broker, Fera Shivaee (CRD #2271590). Ms. Shivaee’s BrokerCheck record, current as of June 29, 2016 available here listed only two customer complaints, both listed as “pending”. Ms. Shivaee’s Case 13-02924 was arbitrated 13 months ago and resulted in a $915,249 customer award available here. FINRA has updated Ms. Shivaee’s BrokerCheck record. Ms. Shivaee’s June 29, 2016 BrokerCheck also changed after our post last week. Ms. Shivaee's BrokerCheck as of July 5, 2016 is available here. The Smith v Centaurus case was resolved in favor of the Claimant in May 2015 but maintained on Ms. Shivaee’s BrokerCheck as pending for 15 more months. FINRA last week updated her BrokerCheck to show the disposition date of May 26, 2015. Investors including her clients and potential clients were misled for 14 months by Ms. Shivaee’s materially false BrokerCheck records. There remains a discrepancy between how Ms. Shivaee’s BrokerCheck and how Centaurus’ BrokerCheck reports the resolution of the same case. Centaurus correctly reports the total relief awarded as $915,249 while Ms. Shivaee’s reports $487,336, both hyper-linked to the same award. It appears that FINRA attempted to quickly fix the two brokers’ BrokerCheck reports we identified but there may still be some systematic fixes required to harmonize the awards database with brokers’ and brokerage firms’ BrokerCheck reports.